The first day of Outside Lands 2018 went off without a hitch. The highlight? Carly Rae Jepsen delighted the crowd with a surprise guest appearance from Mark Kanemura, So You Think You Can Dance star and former backup dancer for Lady Gaga during “Cut to the Feeling.” On social media, Kanemura has made his obsession with the song no secret — a Pride-themed video of him dancing theatrically to “Cut to the Feeling” went viral earlier this summer. Decked out in a rainbow cape, rainbow Speedo, buckets of glitter, and a stack of rainbow wigs he whipped off in rapid succession, Kanemura’s performance was a hilarious and joyful shout-out to Jepsen’s LGBTQ fans. Lucy Dacus, Perfume Genius, Odesza, Father John Misty, Mac Demarco, Beck, The Weeknd, East Bay locals Caleborate and Shannon and the Clams, and comedians Chelsea Peretti and Michelle Wolf also stacked the Friday lineup. Bill Nye (yes, the infamous Science Guy) also made two appearances at the festival. The first was for D.A.V.E. (Discussions About Virtually Everything), the festival’s brand new TED Talk-esque speaker series, which will feature figures including California Lt. Governor Gavin Newsom and Grateful Dead drummer Mickey Hart. The second was on the culinary-themed GastroMagic stage, in which Nye learned how to cook a steak with shouty VICELAND chef Matty Matheson. 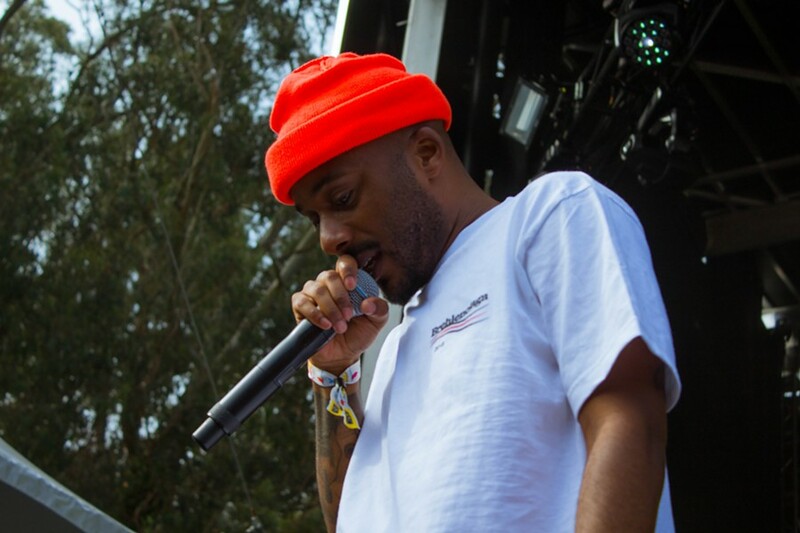 East Bay rapper Caleborate performed at Outside Lands for the first time. But Friday was just the beginning. If you’re hitting up Outside Lands on Saturday and Sunday, here are some things you need to know. This year, if you want to bring in a backpack or a bag bigger than a fanny pack (anything over 6 by 8 by 3 inches), it needs to be clear. Most people seemed to have gotten the clear bag memo for day one, so don’t be that guy who holds up the line today and tomorrow. 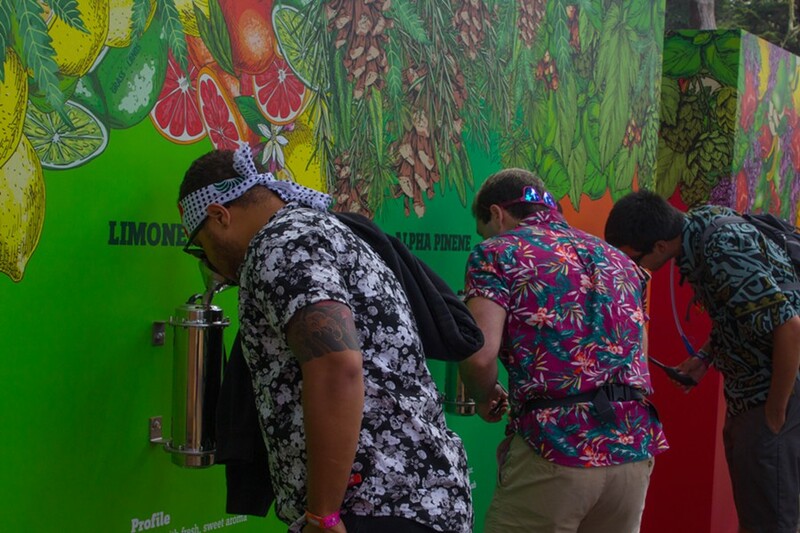 Also, bring a refillable water bottle — avoid spending $4 on disposable water bottles and just hit up the refill stations located throughout the festival. If you want to make the most of the comedy and improv stage, stop by The Barbary up to two hours before the act you want to see goes on. You need to make a seat reservation, which is fairly simple and fast if you get there early — just wait in a very short line and ask for tickets, then go about the rest of your festival day until it’s time for the performance. Catch Jonathan Van Ness of Queer Eye fame on Saturday, or New York stand-up comedian Phoebe Robinson on Sunday. D.A.V.E. speakers are also on The Barbary stage. 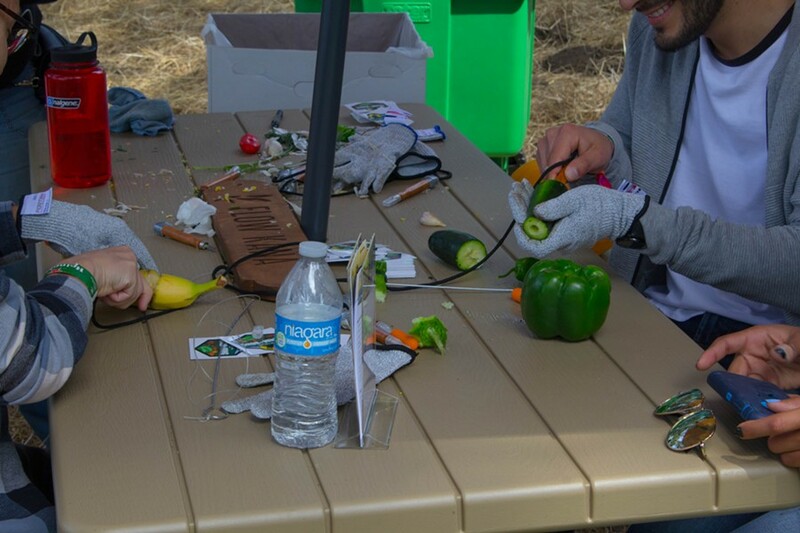 Festival attendees can craft bongs out of produce at Grass Lands. The Smell Wall lets you compare the aromas of different cannabis strains. This year, Outside Lands introduced Grass Lands — a “celebration” of cannabis that actually includes no real cannabis. It’s worth a walk through for cannabis delivery service Farm to Bong’s hilarious build-your-own-bong out of fresh vegetables competition. Or, you can sample cannabis-infused treats without the cannabis, talk to budtenders, or get a whiff of different strains at The Smell Wall. But if you’re looking for actual weed, Grass Lands is not your destination — take an Instagram photo with the big grass-covered Grass Lands sign and seek your festival high elsewhere. 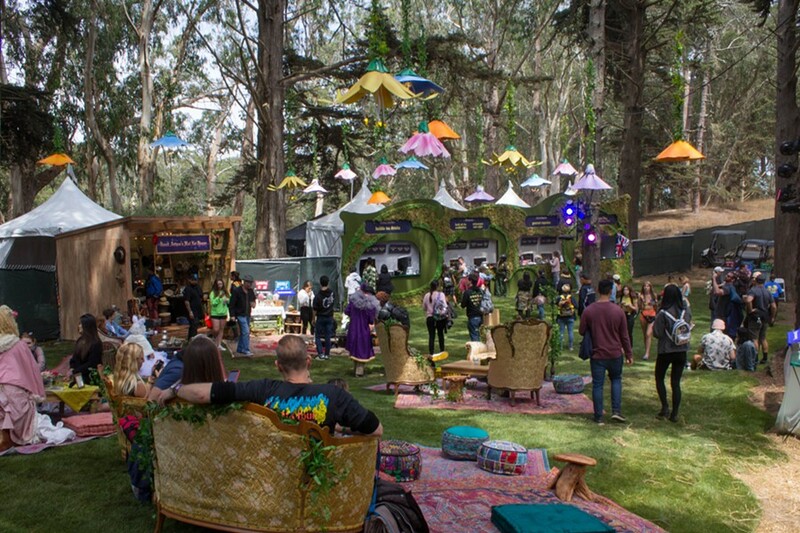 The festival debuted Bubble Tea Party, a new area to kick back and relax. Also new this year is the Bubble Tea Party, a lounge area where you can purchase overpriced boba, shop for an eccentric hat, and revel in the picturesque decor. If you’re lucky, one of the site’s “Mad Hatters” might pay you a visit and do something strange, such as measure the circumference of your head. It’s a bit weird, but it’s a great photo opp. Two more things: the GastroMagic stage has now doubled in size and has relocated to Lindley Meadow, and you can also now order your drinks in advance using the OSL iPhone app. Good luck and happy festivaling.